MAN Diesel & Turbo is introducing the MAN EcoCam as a retrofit solution for the low-load optimization of its low-speed, mechanical engines with single turbochargers. 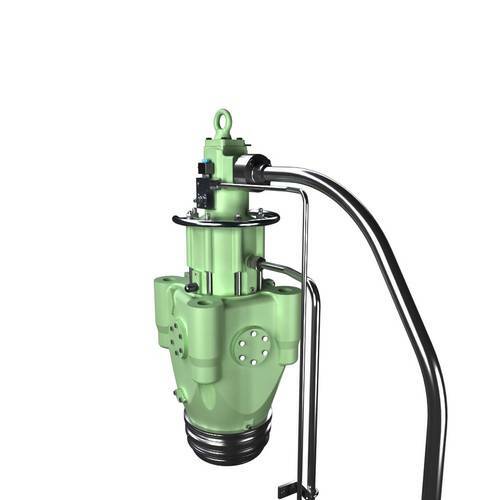 According to the manufacturer, the EcoCam offers significant fuel savings of 2 - 5 g/kW – with short payback times – and delivers an increased Pmax cylinder pressure through the adjustable exhaust-valve timing. MAN Diesel & Turbo is initially rolling out the MAN EcoCam to a number of its MAN B&W S50MC-C engines, and will eventually introduce it stepwise to its mid- and large-bore engine program. The MAN EcoCam introduces a flexible cam profile, called a virtual cam. The profile is controlled hydraulically by adjusting the amount of actuator oil in the hydraulic pushrod. Low-load tuning has an impact on torsional vibration and NOx. When a low-load tuning method is installed on an engine, the torsional vibrations’ impact and the NOx level have to be taken into account to ensure that the vibrations’ impact is not harming the engine and that the NOx level is in compliance with IMO regulations. The new torsional vibration calculation and NOx amendment are included when buying the MAN EcoCam. The EcoCam’s effect on fuel reduction has been verified by two independent testbed installations and aboard a test vessel in service. 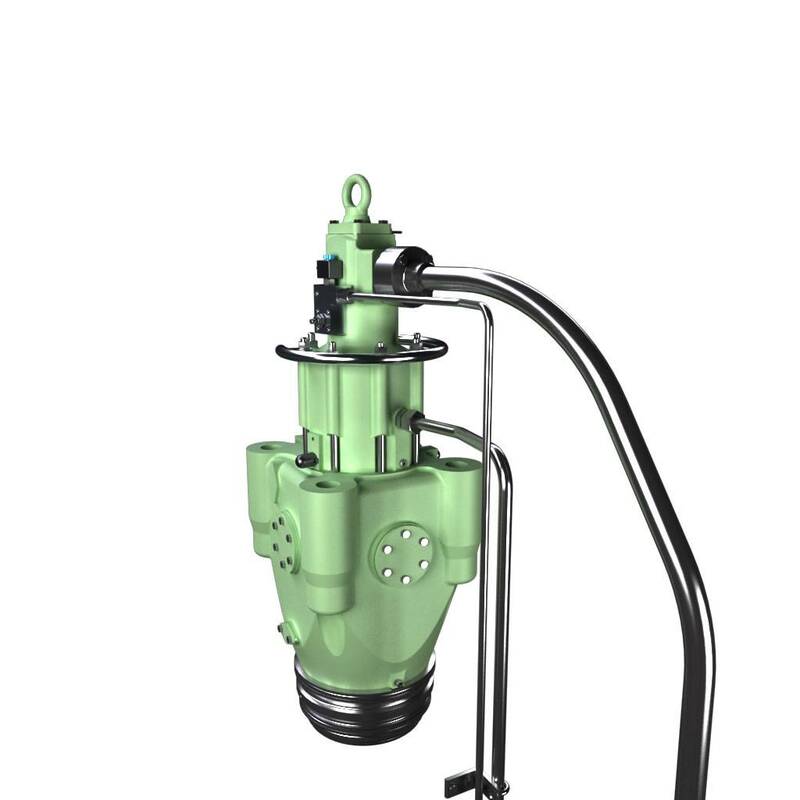 The earlier closing of the exhaust valve provides a higher compression pressure, thereby delivering a higher combustion pressure and a lower fuel-oil consumption. Flexible exhaust-valve timing has traditionally only been available to electronically controlled engines. 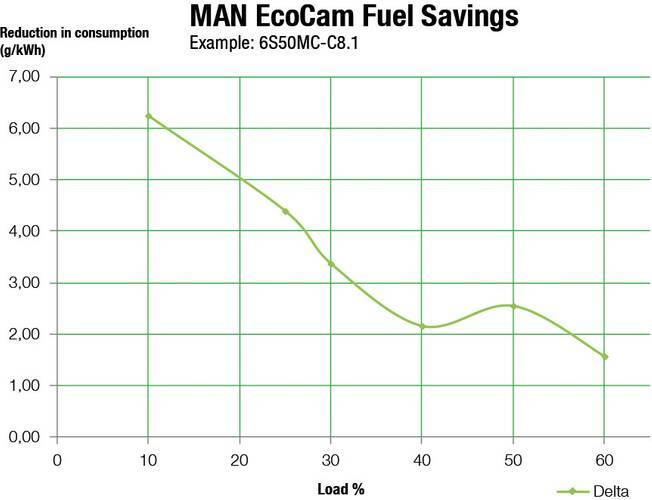 Depending on an engine’s load profile, the MAN EcoCam typically generates savings in the range of 2 - 5 g/kWh. For smaller engines, this can result in a payback period of as little as 1½ years as is the case, for example, with a 6S50MC-C engine with 6,000 annual running hours.